Thanks, but there is no chance of me entering any kayak races. If I was in a hurry, I would take a motor boat! Ha ha. I have been kayaking for a while now and my friends keep asking me why I don't start to race. I always say that I race with myself and the fishes that I still didn't catch. Kayak racing is also not for me. 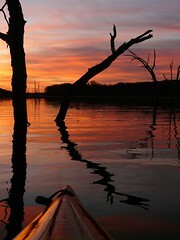 I kayak for the fun and relaxing part of it, taking life slowly and enjoying the view around wonderful kayaking places. Racing will just stress me out.